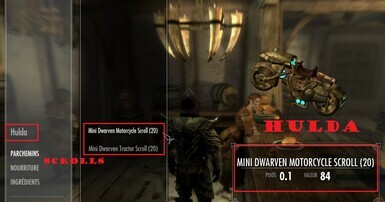 Adds a Dwarven Motorcycle in the Whiterun Stables (with a Dwarven Mistress). 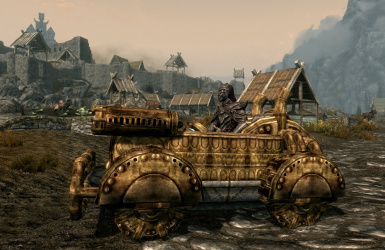 You have also 3 other Dwarven Vehicles (Dwarven Automobiles and Dwarven Tractor). 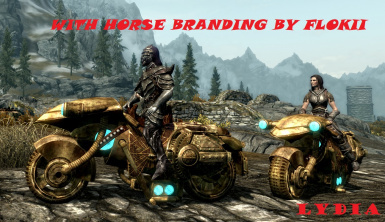 No DLC required. 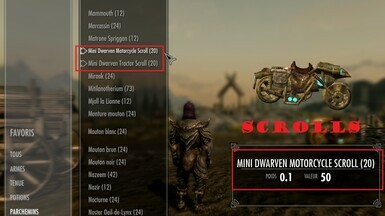 Small changes: new vanilla dwarven sound for the Motorcyle + fixed (i think but i am not sure) a rare bug when the motorcycle attack you ! 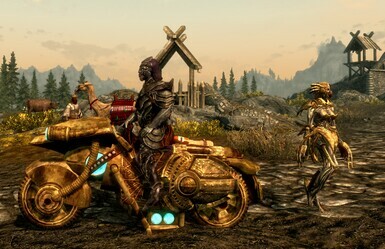 Adds a Dwarven Motorcycle (Dwarven vanilla sound) in the Whiterun Stables (with a Dwarven Mistress). 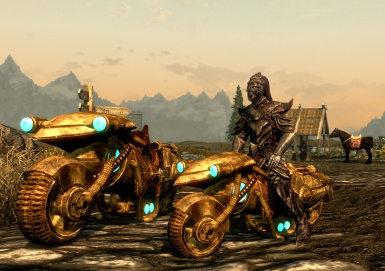 No DLC required. 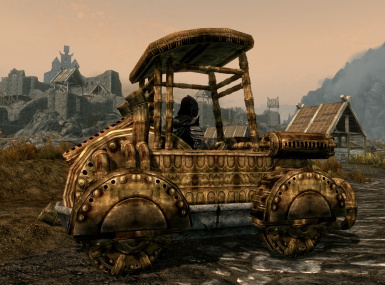 You have also 3 other Dwarven Vehicles (Dwarven Automobiles and Dwarven Tractor). 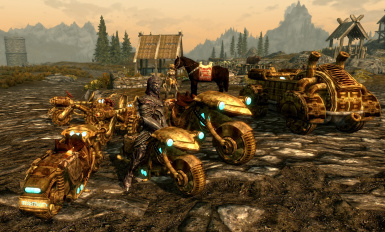 Only summonable vehicles. 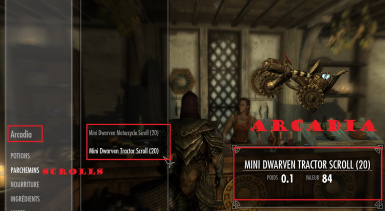 Do not hesitate to loot the inventory of the Dwarven Mistress (Books / Spells and Scrolls) ! 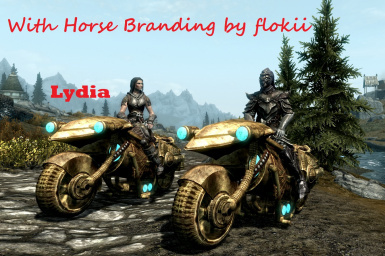 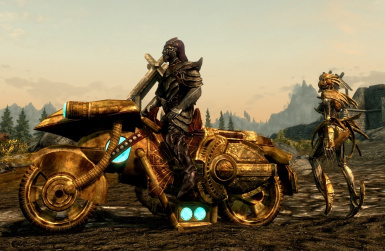 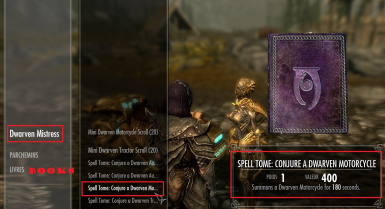 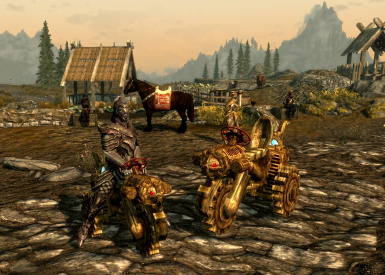 To obtain the Mini Vehicles (Motorcycle and Tractor), you can also buy scrolls found with some Merchants in Whiterun: Arcadia of Arcadia’s Cauldron, Anoriath, Hulda of the Bannered Mare . 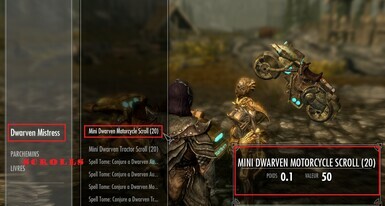 Now open up your inventory, navigate to "Scrolls" and there they are. 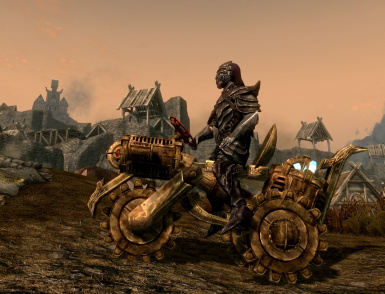 You throw them and when they hit the ground they hatch into Mini Vehicles.